The evil Grindelwald (Jonny Depp) has escaped prison and is on the loose once again, causing havoc to all who oppose him. As Grindelwald looks to gain followers and the trust of Credence Barebone (Ezra Miller), it's up to Newt (Eddie Redmayne) and co to stop him before he causes more destruction. Following in the footsteps of money making machines Star Wars and Lord of the Rings, J.K Rowling's 'Potterverse' continues to expand in prequel form with Fantastic Beasts. The film, of course, was a huge hit at the box office meaning that plenty of Fantastic Beasts have been scheduled for the near future. With decent reviews but not leaving much of an impact, Rowling's second film as a screenwriter still had a lot to do in order to fully convince audiences. Unfortunately, the only thing fantastic about this prequel sequel is the word in the aforementioned title. Franchises are often accused of biting off more than they can chew and for being too interested in setting up future films rather than telling a solid outright story. Crimes of Grindelwald had plenty of promise with the continued exploration of this fascinating world and characters old and new. Shamefully though, the film isn't so much interested in really exploring any of these things in great detail, instead opts to cover all sorts very quickly. Due to this fast skimming over things, most of the time the audience is confused as to what is happening or feeling like there is nothing to these actions. Crimes of Grindelwald isn't a fitting title as it barely features the villain, never mind the atrocities that he has caused. Motivations from characters are unclear which makes every action meaningless and quite boring in most cases. This is a massive problem for the series as it packs as many twists and turns into its 2 hours and 13 minutes runtime but at the end, you feel unmoved, a little confused and also aggravated by this disappointing mess. One of the many problems that plague this series is surprisingly its characters. Rowling did an incredible job with the Potter films and creating likeable, interesting and complex characters who you genuinely cared about or loathed. Something doesn't seem to be transcending in Rowling's ability from novels to film as she fails to improve on this aspect yet again. The lack of personality in these characters was a problem in the first film and its an even bigger problem this time around as we are introduced to many other new characters. There really aren't many who stand out - except a few pesky creatures - as having anything about them, none more so than leading character Newt. As far as main characters of franchises go, Newt is as bland as you'll see, with nothing more than a sort of stuttering shyness to the character. Eddie Redmayne is fairly charming but does not portray the right sort of charisma in this role which makes the character forgettable, uninteresting and not one you would actively root for. You could swap this character out with ease and still have the same result due to the little detail that is given to him. In fact, that goes for pretty much everybody in this series so far. There is a glimmer of hope in this film and it surrounds Zoe Kravitz and her character Leta Lestrange. The character provides interest due to her relationship with Newt and his brother in what proves to be some of the films finest moments. The "love triangle" of sorts looked to be an interesting concept due to the relations they have with each other but unfortunately, it is bogged down, lost in the shuffle and ultimately dismissed in the end. These brief interactions were genuinely compelling whilst looking to set up an interesting dynamic early on in the film. Bizarrely though, this potential is completely squandered as it is barely touched upon later in the film, despite being vastly more enthralling than the nonsense Newt and co get up to. Crimes of Grindelwald is the prime example of a property looking to get by on name recognition alone. This is an incredibly sloppy sequel that despite looking pretty, has failed to resonate with audiences and a fair share of fans too. 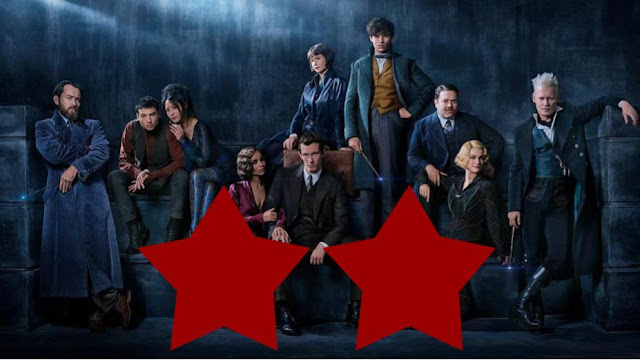 A careless film with little thrills or memorable moments, the Fantastic Beasts series is in desperate need of salvation as this is easily the lowest point in this franchises tenure.